I don’t drink much lager these days because it was pretty much all I drank for 10 years, before I awoke from my self-imposed beer coma and discovered craft beer as a flavoursome alternative to the flavourless dross the multinationals were relentlessly peddling. So it’s with baited breath that I open this bottle of Auckland brewery Epic’s lager, hoping that I haven’t just wasted a few bob on yet another bland, fizzy yellow beer. Blurb on the bottle: Imagine a world without flavour. It’d be almost as bad as a world without beer. Well you’re in luck. This lager is literally bursting with hop-fuelled taste. It’s been created by people inspired and obsessed with keeping the flame alive. Enjoy our handiwork. Taste test: So lager doesn’t have to be bland, watery, boring beer for the masses, after all; it can be deceptively complex, smooth, and as refreshing as a cool summer breeze over a crisp, blue lake. Okay, so Epic Lager isn’t exactly “bursting with hop-fuelled taste” as it says on the bottle – though relative to your average mass-produced lager, it is – but it does have a slightly tart-ish taste, bready and dry, with a faintly sweet, fruity finish. It pours pale yellow with only light lacing around the rim of my glass, and boasts a zestier, grassier aroma than average. The verdict: Epic Lager is exceptionally easy to drink, but is it an exceptional beer? Yeah nah. It’s another first-rate and top-notch beer by Epic, but if Best Beer HQ were to ever publish a list of the brewery’s best beers, this one wouldn’t crack the top five (Hop Zombie and even its much more sessionable cousin, Epic IMP, are hard acts to follow). That makes this beer a victim of Epic’s own success, as well as the limitations of the lager style in general, which don’t allow for beers that are literally “bursting with hop-fuelled taste”. Still, this one is a heck of a lot better than most of them out there in the market today. 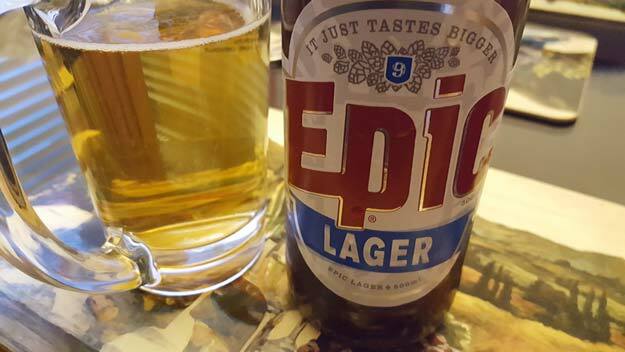 Beer/movie pairing: Lager is a popular “for the masses”-style of beer, and Auckland brewery Epic is, well, epic. So what’s a popular epic?